Before 'Radius Chine' most sailboat displacement hulls were designed single or double chined. True round hull designs were cost and skill prohibitive for most amateur and many professional builders. Another construction method for rounded displacement hull forms was needed. The method would have to be easily build, decrease cost and skill requirements for a true round type build. 'Radius Chine' design filled this need. 'Radius Chine' is a comprise design and construction method. It simplified the building process for amateur and professional builders by emulating a true round surface by placing a single radius along the length of the hull between two developable surfaces. While not being true round, it was a good beginning. The radius section is designed tangent to the upper surface or freeboard of the hull, and to the lower surface or bottom of the hull. This non-developable, radius section of the hull is approximately developed by applying it to the hull in segments along its length. In practice, the segments along the length of the hull are all pre-rolled to the defined radius. Each segment is than custom fitted around its perimeter to adjoining segments and to tangent locations at the theoretical Longitudinals between the upper and lower developable surfaces. 'Radius Chine' does allowed the average person who may have previously limited themselves to hard chine designs to build a rounded hull shape. 'Radius Chine' simplified the fabrication process for rounded hull forms, which succefully imitate a true round hull. There are however issues with 'Radius Chine' construction. By its own nature the design methods restricts hull shape to a single radius between two developable surfaces. The design method also forces much of its curved section at the turn of the chine below the design waterline, making the hull look slab sided. If you think about it, what is the point of having a rounded hull if you cannot normally see that curved section? Even with these issues 'Radius Chine' design and construction was a good first step towards true round construction. Need is the 'Mother of Invention'. Since 'Radius Chine' design could never define or build a classic true round tumblehome hull design like the "Bezier 12.5", cause me to systematically developed 'Bezier Chine' design and construction. It is the next logical step to true round construction. 'Bezier Chine' is a high tech design method, built by low tech construction process. More details on the working of 'Radius Chine' and 'Bezier Chine' are available in my book 'True Round Metal Boat Building' for sale at Amazon and kindle. 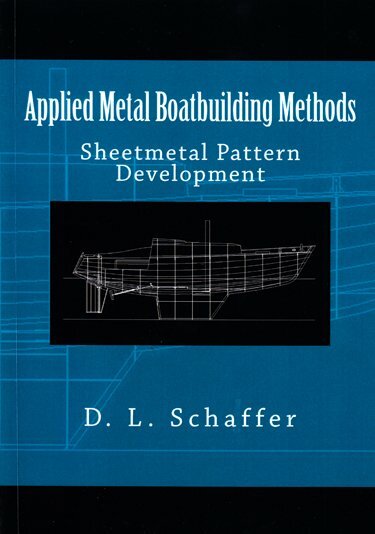 This is the first book to fully illustrate the hands on construction of a true round hull.